If you’re thinking about claiming a welcome bonus from an online casino, you need to know about wagering requirements. They may seem finicky, perhaps even a touch unfair, but playthrough rates are part and parcel of casino bonuses.This goes all over the internet, so you’d better get used to them. If you aren’t familiar with what they are or how they work, though, then it is time you found out. After all, not successfully clearing the wagering requirements of any casino bonus you plan on claiming could leave you with a nasty surprise. Such as not being able to take home your winnings. 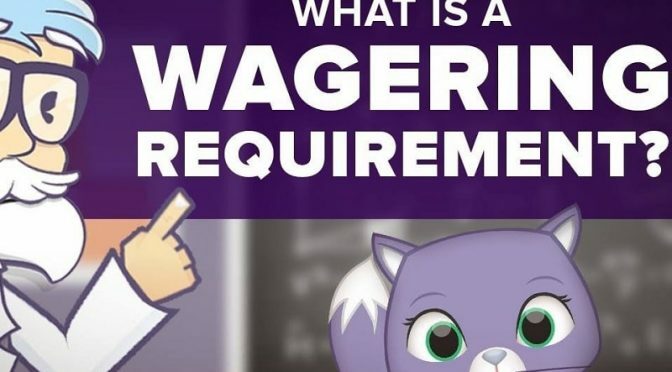 What Are Wagering Requirements at Online Casinos and Why Should I Care? All online casino bonus offers (well, almost all of them) come with wagering requirements. Also known as playthrough rates. These stipulate that you must wager any bonus cash you receive a handful of times before you can withdraw any winnings you have from those bonuses. Why? Well, if casinos didn’t put these conditions in place, what is there to stop you claiming $1,000 in bonuses. You might just be walking away with that cash not? Casinos offer you bonus cash in good faith. In return they expect that you will use these funds for playing games at their site. To ensure that you do, they ask that you wager said bonus figures several times before withdrawals are permitted. In some cases players won’t just need to wager the bonus amount. You can either be confronted with the bonus and the amount you deposited. That can prove to be quite challenging if you’re not particularly good at mathematics. Fortunately, it doesn’t have to be quite so complicated. Before claiming a bonus a player must check out the wagering requirements of that offer. They can do this by looking at the terms and conditions of any offer they intend on claiming. Generally speaking, the industry standard wagering requirements for a match deposit bonus welcome bonus is around 30x to 40x. Anything higher than 40x represents a bad investment on your part. Of course playthrough rates which are lower than 30x are highly attractive to players. Bonus Only Calculation: Let us say that you claim a bonus worth $100, and the requirements stipulate that you must wager the bonus amount 40x before you can withdraw. That’s easy to work out. $100 x 40 means that you need to stake $4,000 on games before you can take home your winnings. Bonus + Deposit Calculation: It gets trickier when the casino includes the deposit into the equation. If you deposit $100 and claim a $200 bonus, then the value of your balance is $300. It is then this figure that must be wagered 40 times, meaning that you’ll have to wager $12,000 before you can withdraw. The general idea is to keep track of what you’ve wagered. Over time you should be able to deduct your wagers from that figure. Giving you a rough idea of how much left you must stake before you can withdraw your winnings. However, most casinos simplify this process for you. The do so by letting you know how far away you are from fulfilling your wagering requirements. The casino’s customer support team can often provide you with this information, too. If you read the terms and conditions of the bonus, you will find that not all games contribute towards the fulfilment of your wagering requirements. Game weightings (as they are sometimes known) change from casino to casino but a standard is adhered to by most sites. For instance, if you wager $1 on a slot machine, then that $1 is likely to count 100% towards your play-through rate. Meaning that you’ve knocked $1 off. However, table games (for instance) may not contribute 100% towards it. Let us say, in this example, they count for just 50%. That means that for a $1 wager on blackjack, you’ll only knock 50p off your wagering requirements. It will take you a considerable time to clear those requirements. You need to identify the games which contribute to the fulfilment of those requirements the quickest. To do that you need to revisit the terms and conditions to see what the game weightings are. No casino will ever permit a withdrawal until you fulfil the requirements of a bonus. Any player will be in breach of the terms and conditions of the bonus offer until they meet those wagering requirements. That isn’t a serious issue or anything like that. It merely means that withdrawals will not be permitted. This can only be done after a player clears the playthrough rate. At no point will winnings be taken from you. Bear in mind though you won’t be able to withdraw them until you meet the original requirements of the bonus you have claimed. With that in mind, it always pays to look at the wagering requirements of any bonus offer you intend to claim.